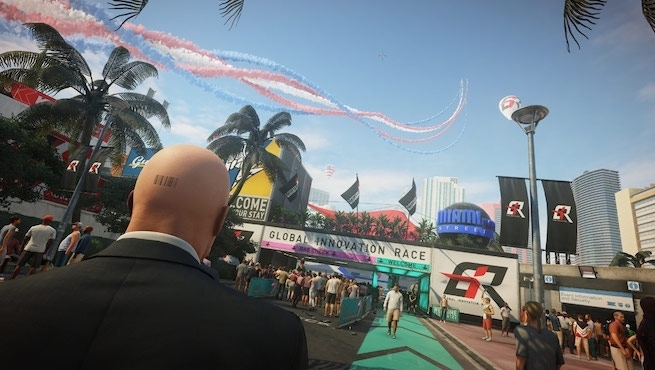 Developer IO Interactive has detailed the features coming in the February 26, 2019’s update for Hitman 2. Agent 47 has been busy, with many contracts to choose from and nearly an endless amount of ways to take out targets. In this latest update, which will be live by the time you read this, you’ll have dozens of fixes and improvements, so let’s get into the most notable ones. For starters, the update will take up around 1 GB of space, so you shouldn’t have any problem making room on your hard drive. You’ll see an enhancement made to the lighting of Legacy locations, with the addition of HDR adaptation, tweaks to sky colors, and higher contrast. IO has added a way to sort your inventory loadout, too, adding categories so you can more easily find a specific setup that works for a mission. One of the more prominent additions is a change to the way NPCs will react to Agent 47’s weapon fire if they haven’t witnessed the shot being made. There is an added level of realism to this change, as NPCs would previously make a beeline to the location in which the shot took place, despite not having witnessed it being made. With the latest update, NPCs will act more realistically and search the area of the bullet and use that to try and locate where the shot could have come from. IO has also removed 3 of the challenges from the Isle of Sgail; All the King’s Men, Making Waves, and No Budget For A Railing, stating that the community wasn’t having fun with them. Any player who has already unlocked these challenges will retain their XP. Among the numerous new features are a myriad of fixes. There was an issue that players were experiencing in which you were unable to take a disguise from a container with two bodies placed in it, which has now been fixed. Another issue that caused a crash if Agent 47 acquired a large weapon from a briefcase while holding a similar weapon has also been fixed. Sadly, an update that is still not present is one that adds a Platinum trophy to the game. This and the previous Hitman game both had a ton of trophies but did not include a Platinum, despite being a major release. It’s unclear how difficult that is to patch in, but it’s something that the community would love to see added. Game Update 2.14: What’s NEW? We’ve added Inventory Categories to make it easier to find and choose the items you want to take into a mission. Loadout selections will be sorted into tabs (Melee, explosives, etc) that can be individually selected. We’ve changed the mini-map icon for an unconscious NPC. It was previously a white dot and looked too much like an Enforcer. Now, it mimics the HUD icon you see above an unconscious NPC in-game. We’ve made a change to how NPC’s react to weapon fire when they haven’t seen 47 take the shot. Previously, guards would (sometimes immediately) approach the location that the shot was taken from and search. They might also suppress that location with gunfire too. Now, they will start by searching at the place that the bullet landed and will start to figure out where the shot came from. They will only look at where the shot was fired from if they have line of sight to it. Depending on the circumstances, they may also suppress the location and begin to move towards it. It’s important to note that 47 can only be compromised according to the normal game rules: one of the NPCs should get close and spot him near the location where the shot originated from and then they can link him to the crime. The complexity of our game and it’s various potential states makes it difficult to give a full explanation of all of the possible scenarios and reactions that could play out. However, we expect that this change will reduce any confusion about how and when 47 is spotted/compromised when engaging in long distances, especially the unfair feeling that the guards instantly know where 47 is after firing a shot. We’ve made a change to how the Remote EMP Charge is disarmed. Previously, it could be activated/triggered whilst being carried by an NPC and would then be disarmed when the NPC ‘secures’ it in a weapons locker. Now, the EMP can be triggered at any point and will not be disarmed to allow for some more unique gameplay opportunities. We’ve added the Steady Aim trait back to the Silverballer and Silverballer Mk 2. We’ve also reverted the menu images for these two guns back to silver. We’ve added a new HUD image for the Rubber Duck Detonator. The guard added in Master difficulty on the roof next to the Headmaster in Marrakesh is now a better guard. A tiny bit better. We’ve added the Meaty Bone and Sacrifical Knife as options for the loadout. These unlockables could only previously be taken on a mission through an Agency Pickup. We’ve moved the Broadsword and Mace into the ‘Weapons’ category in the Inventory. Previously, they were tagged as ‘Gear’. We’ve added a new menu image for the Measuring Tape. We’ve made a change to the damage drop-off for the Concept 5 Pistol (Miami Mastery Unlock), which was too low after a range of about 50 metres. The damage for this gun has now been increased when fired at range. We’ve given additional clearances to the guard in the security room in the Landslide Bonus Mission so that he’ll now react when 47 is caught trespassing by a security camera. We’ve adjusted the mission end rating screen to only show the ‘score animation’ once. Previously, the animation would play and would then play again after returning from the Detailed Score page. Now, it’ll only play the first time. We’ve given one NPC near the default Starting Location in Santa Fortuna a new set of clothes. This is because he’s got a twin nearby and their choice of clothing made it difficult to tell them apart in Contracts Mode. We’ve added Gunther Mueller and Spencer Green as enforcers for themselves in Whittleton Creek. We’ve added a new version of the ‘Priceless Challenge’ to Whittleton Creek. This time, you’ll need to Deliver the package for Mr. Batty and then find a way to make him go batty. Game Update 2.14: What’s Changing? We’ve fixed an issue that could cause guards to get stuck in an alerted state. If 47 triggers the alerted state and then changes disguise without the guards noticing, the guards could then get stuck. We’ve fixed an issue that could make it impossible for 47 to take a disguise from a container that had two bodies placed inside. We’ve fixed an issue that could prevent the ‘Discover [Location]’ challenges from unlocking. We’ve fixed an issue where concealable items (such as the Custom 5mm pistol or Concealable baton) would be labelled as ‘detected during frisk ‘ when inside a briefcase. We’ve fixed an issue where NPC’s that kill themselves, or are killed by another NPC, would prevent the Silent Assassin rating from being awarded. We’ve fixed an issue where 47 would sometimes not be able to close doors from the side/behind. This was previously possible prior to the 2.12 update and has now been rightly re-introduced. We’ve fixed an issue that could reliably cause a crash if 47 retrieves a large weapon from a briefcase while already holding another identical weapon. We’ve fixed a visual issue with the images used for Remote Concussion Device and the Remote Explosive Device; we’ve fixed the Notebook image and added a custom HUD image. We’ve fixed an issue where tasers would not be insta-destroyed when used to trigger an accident with a gas leak or flammable liquid. They have always been insta-destroyed when used to trigger an accident with water, and will continue to do so. We’ve fixed an issue that could cause the ‘Contract’ Mission Stories in Mumbai to be failed if 47 discovers the identity of the Maelstrom before starting them. We’ve fixed an issue where Catalina would walk between the balcony and Rico’s Office endlessly if 47 doesn’t follow her path and runs instead straight to Rico’s Office. We’ve fixed the Mastery Progress bars in the Statistics Menu for Hawke’s Bay and Whittleton Creek. They’ll now correctly display 5 and 15 levels respectively. We’ve fixed an issue where dragging a body in a specific spot in Isle of Sgail could cause 47 to begin floating. We’ve fixed an issue that could make it impossible to pick up the items inside the Ark crates on Isle of Sgail after performing a save/load cycle. We’ve fixed an issue where the area names on the Map for Isle of Sgail would overlap and be difficult to read. We’ve fixed an issue on Isle of Sgail where 47 could enter cover in a specific area and seemingly be invisible to guards. Now, they’ll still have a target. We’ve fixed an issue where 47’s running animation would be different (in a bad way) when holding certain coins. We’ve fixed an issue where sabotaged phone booth kills would correctly be counted as accidents, but the bodies being found would still incorrectly impact the end contract score. Fixed. We’ve fixed an issue in Mumbai where some Limited Vision Areas (bushes) didn’t conceal 47, even though it looked as though they should. We’ve adjusted the size of some of them and added their ability to conceal. We’ve fixed an error on the Miami in-game Map where ‘Acquarium’ was mispelt. We’ve fixed an issue that would cause the game to crash after shooting a toilet control panel twice. We’ve made a visual fix for some of the unlockable suits in the menu so that they match the actual colour of the suits in-game. We’ve only updated the menu images and not made any changes to the suits in-game. We’ve removed the “non-lethal throw” tag from the Rake, because it cannot be thrown. We’ve fixed an issue with the French localisation for a challenge in Santa Fortuna that could cause some confusion about how to complete it. We’ve fixed an issue that could cause the framerate to drop for Xbox One X users that have enabled the ‘High Quality’ rendering quality. We’ve fixed an issue in Hokkaido where the game would crash if you used a cleaver (or had one in your inventory) to cut the fugu fish. We’ve fixed an issue in Paris where the guards in the basement security room might treat their own weapons as suspicious and move them from the table to the weapons locker. We’ve fixed an issue where the Elite Soldier disguise in Marrakesh would incorrectly be considered ‘Trespassing’ on the school grounds, if it was acquired in a particular way. We’ve fixed an issue where 47 can get spotted when using the Morgue starting location in Hokkaido on Master Difficulty. We’ve fixed an issue where 47 would get frisked outside of Strandberg’s Office in the Swedish Embassy in Marrakesh, even when wearing the Embassy Security disguise. Now, he’ll just be allowed straight into the office. We’ve added a Game Rules tile to the lobby to make it easier to learn what Ghost Mode is all about. We’ve added game stats to the end game score screen. As well as the final score, you’ll now also get an overview of various statistics such as deaths, NPC kills, disguises used, etc. We’ve added two new loading tips for Ghost Mode about item drops and noticed kills. We’ve added scroll-wheel functionality to the Destination and Campaign pages that allows players to scroll through those menus when the mouse cursor is placed in the lower half of the screen. Scrolling will change the displayed location, but will only change the selection if the cursor is placed on the location name. We are aware that players on PC are experiencing issues with “0x8000000_” (and related) crashes. We’re working on a solution to this with our friends and partners at Nvidia. We are aware of reports from our community that when 47 wears disguises with sunglasses, the glasses don’t reflect in mirrors. This is done intentionally for performance reasons and won’t be changed. We have received reports that the Manhole Challenge in Whittleton Creek doesn’t unlock when completed in Contracts Mode. This is because it was never intended to be available in Contracts Mode and was mislabeled. As of 2.14, we’ve moved the challenge to only be visible under the ‘Another Life’ Story Mission to clear up this confusion. When getting frisked with the briefcase, it can sometimes result in an animation where the briefcase clips through 47’s legs. It’s just a visual issue and will be fixed. The Shashka A33 rifle has barely audible sound effects when fired by NPC’s. This will be fixed in a future update. Will you be jumping back into Hitman 2 to check out these changes? Let us know!